The knee is one of the more complex joints in our body. Our knee is composed of three bones. The Femur, or thighbone, is positioned on top of the Tibia, or larger leg bone. The Patella, or kneecap, glides in a groove on the end of the femur. Large muscle groups in our thigh give the knee strength and stability. Knee problems can occur from injury, disease, aging, or “wear and tear.” Any of the knee ligaments may be torn by an injury, especially during sports. 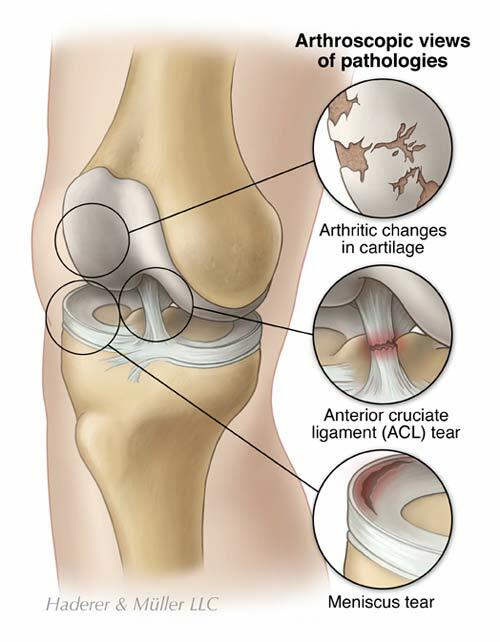 The Medial Collateral Ligament most frequently tears during football, basketball, and volleyball. The Anterior and Posterior Cruciate Ligaments are frequently injured in football. 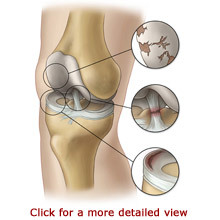 Most knee conditions can be treated with non-surgical methods. This includes medication, knee bracing, and physical rehabilitation. Physical therapy is used to improve strength, flexibility, and functional movement. Arthroscopy is recommended when such treatments have provided minimal or no improvement of your symptoms. Arthroscopy is commonly used to reconstruct ligaments and remove or repair torn meniscal cartilage, synovium, or bone fragments. Your doctor will discuss your examination results and help you decide on your course of treatment. If you have surgery, you will be instructed to elevate your leg and apply ice to your joint to help reduce pain and swelling. Your surgeon may restrict your activity and may recommend that you wear a knee brace for a short period of time following your procedure. Physical therapists will show you how to exercise your knee to gain strength and flexibility. You will most likely need to use crutches, a walker, or a cane to help you walk at first. Your surgeon will instruct you regarding how much weight to put on your leg, depending on your procedure. Your physical therapist will gradually increase your exercise program to increase your strength, coordination, and endurance. When your incisions are healed you may perform physical therapy exercises in a heated therapeutic pool. The heat may help to relieve pain and stiffness, while the water provides you with support while exercising your joints. It is very important to keep the muscles around your knee joint strong. Eventually, your physical therapist will provide you with a home exercise program.